In the previous article, we described, in detail, the different stages that a submitted SQL Server query goes through and how it processed by the SQL Server Relational Engine. The SQL Server Relational Engine generates the Execution Plan and the SQL Server Storage Engine performs the requested data retrieval or modification process. In this article, we will discuss the different types and formats for SQL Server Execution Plans. The SQL Server Execution Plan is the graphical representation of the execution roadmap of the submitted query that will be followed by the SQL Server Query Optimizer, with the cost of executing every part of the query code. SQL Server provides us with two main types of execution plans. The first type is the Estimated Execution Plan. It is the plan that is generated by parsing the submitted query as an estimate of how the query will be executed, without being executed. The second type is the Actual Execution Plan, that is generated by executing the submitted query, displaying the actual steps that followed while executing the query. The Actual Execution Plans are preferred most of the time by database administrators as it shows more information about query execution statistics. You can benefit from the Estimated Execution Plan in troubleshooting complex queries that take a long time to run, where you will be able to generate the execution plan without the need to execute it. But in some cases, the Estimated and the Actual Execution Plans can differ greatly, due to the difference between actual table data and statistics. Frequent data insertion and modification operations can also make the statistics less accurate. For more information about the Actual and Estimated Execution Plans, check SQL Server Estimated Vs Actual Execution Plans. In SQL Server 2016, Microsoft introduced a new feature that provides us with the ability to monitor run-time statistics, also called the Live Execution Statistics, for each operator in the execution plan and track the flow of the data between the different operators during the query execution process. The execution statistics include the number of processed rows, the time consumed by each operator and the overall progress of the query execution. 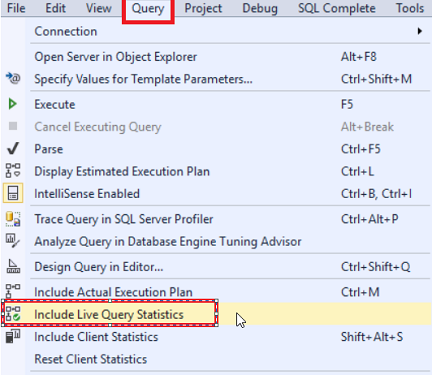 For more information about the new Live Query Statistics feature, see Troubleshoot SQL query performance using SQL Server 2016 Live Execution Statistics. The text plan provides us immediately with the least details about the query execution, in a flat text view, making it quite difficult to analyze and not preferred by the database administrators. The XML plan provides us with a complete set of information about the query execution viewed in XML structure, that is difficult to be read and analyzed and easy to be shared with other experts for troubleshooting purposes. Till this point, we became familiar with the different types and formats of the SQL Server Execution Plans, the differences between these types and formats and how we can take benefits from these types. Stay tuned for the next article, in which we will discuss the different components of the Execution Plan and how to analyze it.